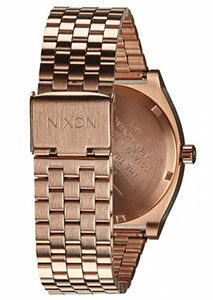 If you’re looking for a watch that suitable for multiple purposes, take a look at Nixon watches. 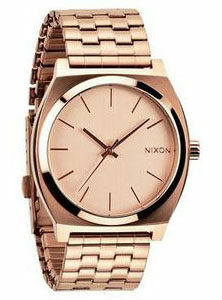 There are so many famous watch brands, we are sure Nixon is one of them. If you haven’t heard of this name, check out this Nixon watches review of six highly esteemed products. Currently Nixon is one of the best watch brands in the world. The company is famous for manufacturing quality watches, which is what you’d want in a regular wear. It has gathered much popularity all over the world. Are Nixon watches good? Just read this Nixon watches review and we are sure you will find it out. Pros: 1. 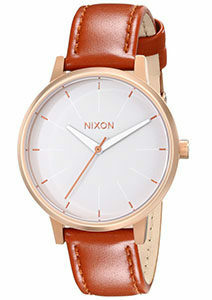 Simple and classic, carries the brand value that Nixon provides at a low price range. 2. It is a nice touch that the date adjustment has the days of the week in English & Spanish. 3. The leather band is very comfortable and provides a much-needed break from the overall theme. 4. Water resistant to 100 m (330 ft) , which lends it usable during swimming and snorkeling. 5. Has sixteen different color tones for you to choose from. Cons: 1. The day/date mechanism is a bit glitchy. 2. The leather strap will get older or even tear up after a while. 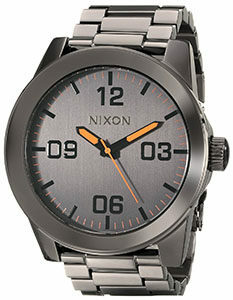 Nixon brings the big game forward with the release of Men’s A105 Sentry Watch that is fabulous in every way. Bringing the reliability of the company combined with their meticulous attention to detail, this is one watch that’s meant for the masses. Priced at an optimum level and packed with many exciting features, this watch is certainly something to look out for. The model comes with exotic -looking triple gasket crown with enamel fill and 23 mm leather band having stainless steel buckle. Also, shiny blue dial window and the day and date window at 3 o’clock brings some much-needed refreshment. 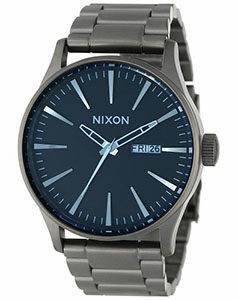 Like many other simplistic designs made by Nixon, this one too offers outstanding value for money. 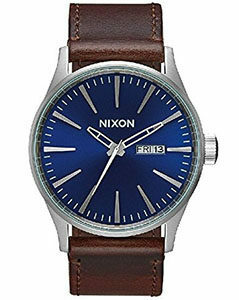 Additional, this watch boasts of Japanese quartz movement and water resistance to 330 feet speaks volumes about Nixon’s commitment. The water resistance makes it suitable for swimming and snorkeling. So, the next time you’re in the mood to get wet, there’s no reason to dress down. Not lacking in elegance, this model doesn’t compromise on boldness either. It comes with a 42 mm case diameter that is bound to look outstanding on your wrist. The blue dial combined with the brown band color makes for an interesting combo that is worthy of a mention. Overall, this watch can be considered a prize possession for those who have a taste for it. Pros: 1. Great looking watch with bold design and elegant details at a reasonable price. 2. Can complement both formal and casual attire. 3. The double-digit Arabic numeric looks well in combination with the dial. 4. Water resistant to 100 m (330 ft), which will let you go swimming and snorkeling. 5. Has fifteen different color tones. Cons: 1. Impossible to read in the dark. 2. May be too big for some people’s wrists. 3. Do not show date. 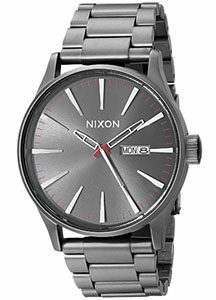 Solid, bold, and built to impress, Nixon Men’s Corporal Stainless Steel Watch is a product made of perfection. This company has already built a reputation for selling products at a reasonable rate. This item isn’t any different from the other models in their lineup regarding the price. But, as far as features and design are concerned, this is more than just a combination of simplistic design. For starters, it features a solid round dial that holds double-digit Arabic stick and numeric indices. The mineral dial window and 44 mm stainless steel case ensure optimum durability and ruggedness to withstand all situations. The Men’s Corporal Stainless Steel Watch boasts of Japanese quartz movement among many other things. With analog display and mineral dial window, you are assured clear visibility in proper lighting and protection from scratches. The watch also consists of a three-link stainless steel band featuring micro-adjust closure, and single push-button enabled safety mechanism in the fold over clasp. Resistance to water is another bonus you can expect to perform extremely well with depths to 100 m. If you want to go snorkeling and swimming, don’t hold back. Just dive in and have fun without any worries of your watch getting damaged. With so many interesting features, it is easy to see why this model is so popular among the consumers. Wear it once, and you will also feel the same way. Pros: 1. Classy watch with stunning understated design at a affordable price. 2. The watch goes well with both casual and dress attire. 3. Skeleton hands have been introduced for added uniqueness. 4. Water resistant to 100 m (330 ft). 5. Has fourteen different color tones. Cons: 1. The date/day is a bit difficult to set up in the beginning. 2. The band quality could have been better. Nixon’s lineup of men’s watches is as impressive as it gets. Adding to the impressiveness is the Nixon Men’s A3561 Sentry watch that comes with Japanese quartz movement with analog display. Embodying the level of perfection Nixon has reached over the years, this is another beautifully crafted model that stands out on its own. The perfect solid dial with its round shape and 42 mm stainless steel case pair up to make for the ultimate combination. The mineral dial window ensures that no scratches or damage cause harm to the display, and you get a crystal-clear view. The stainless steel band comes with a fold over clasp having push-button safety and micro-adjust closure. This ensures that the watch is safely attached to your wrist, and there is no difficulty in operating the clasp. This model comes with features that ultimately justify its price tag. Some unique features include skeleton hands, day/date window located at 3 o’clock and water resistance to 330 ft. You never have to worry about damaging this product when you take a dip in the pool or go snorkeling with your friends. However, this watch is not meant to withstand water infiltration in deep sea diving, and this may lead to damages. All being said and done, this model is a great looker and performance spectacularly well in all situations. Pros: 1. Simplistic design with expensive looking at a low price range. 2. Suits a wide range of looks from a formal business look to a casual night out with friends. 3. Water resistant to 100 m (330 ft), so you can jump into the pool or hit the beach without any worries. 4. Has four different color tones for you to choose from. Cons: 1. The clasp is a little loose, not very secure. Carrying the theme of simplistic design and minimalist features, the Nixon Women’s A045897 Time Teller watch is something to look out for. While the first impression of this model may not appeal to everyone, it will play its charm to classic watch lovers. Who are these people? Well, they’re the ones who just prefer to wear a watch to see time and maybe sometimes, find out the date. Even though this beauty does not have a date window, it certainly appeals with its single tone color. Made of stainless steel, this watch comes with a sunray dial and stainless steel case of 37 mm. 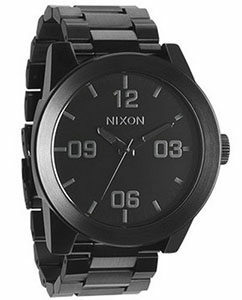 The Nixon logo is located at 3 o’clock, and it looks fabulous in every aspect. The one single feature that makes this model more useful is its water resistance capability. At a price range like this, you get a wrist wear that is water-resistant up to 100 meters (300 ft). This means you can easily take a splash in the pool without worrying about the watch getting damaged. 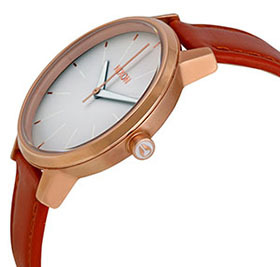 It comes with quartz movement alongside analog display, which completes the traditional look. And the band features fold-over clasp and single push-button safety. This watch is available in four shades: black, gold tone, silver tone, and rose gold tone. Overall, this watch is more than just a value for money purchase to those who aren’t looking for anything fancy. Pros: 1. Very classic with simplistic design at a affordable price. 2. Can be matched with a variety of attire. 3. Water resistant to 165 feet. 4. Has seventeen different color tones. Cons: 1. The strap looks kind of cheap and a little stiff. 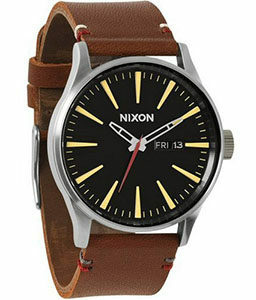 Nixon has once again stayed true to their theme of improving the “little” things and offers up this product as a result. With the company’s motto of developing the finer details, the Nixon Women’s Kensington Watch performs as advertised. It looks classy, elegant, without ever going over the top. This model is perfect for women who are working as professionals or want a simple wrist wear for all purposes. You’d be surprised to know how much work has got into making this product of ideal craftsmanship. Utilizing the advanced Japanese quartz movement, this model doesn’t fail to make an impression in any way. The sophisticated design consisting of 16 mm leather band with stainless steel buckle add finesse to the model. With Case diameter of 37 mm, this model remains elegant but doesn’t deviate from its boldness. If you’re in the mood to take a light swim, don’t hesitate because the watch provides water resistance up to 165 feet. With attractive features such as the ones mentioned above, this model is certainly worth its price. When you buy a wrist wear, you deserve to have only the best because everything else isn’t worth your time. Wear this watch with your office attire to add a touch of elegance and turn everyone’s heads. You can also couple this with a party gown to be the star of the event. Pros: 1. Fantastic camo combining different colors add plenty of uniqueness. 2. This is a great casual wrist wear you can buy to wear at all casual events. 3. Easy to adjust the bracelet to fit your wrist size. 4. Water resistant to 99 feet that makes this model ideal to be worn at the beach. 5. Has nine different color tones. Cons: 1. The pin is little flimsy. 2. May be a little light for some people’s tastes. 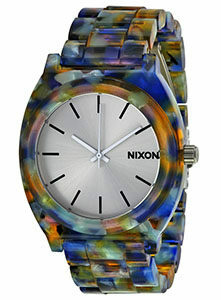 The Nixon Women’s A3271116 Time Teller Acetate Watch is unlike any others. Combining flashy, psychedelic themed design, and the durability of Nixon, this product certainly revolutionizes the watchmaking craft. With features like analog quartz movement and water resistance up to 99 feet, this model can certainly be handy in many situations. It comes with a case diameter of 40 mm that looks beautiful from any viewing point. One glance at the watch and it’s difficult for anyone not to get mesmerized. 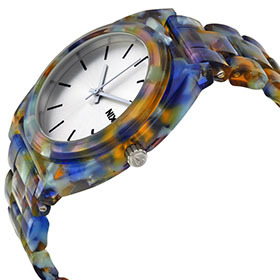 The blue, yellow, and white color camo works remarkably well with the overall watch built and adds quite a bit of funk. This watch by Nixon is not just for seeing time, but for creating a mark for yourself. The numberless three-hand dial and acetate band combine to give a blank canvas for your imagination to run wild. Sure, you can also match them with your clothing creations and improve the overall look quite significantly. Because this is more of a casual accessory, it would look perfect as a daily wear. Wear it once and you’ll fall instantly in love with this product that has been crafted with utmost care. The company has once again brought you an incredibly trendy watch at a reasonable price that you won’t stop raving about. Buying watches is no walk in the park, especially when there are so many brands available in the market. You may choose a model based on its looks but find out their quality is inferior. You may also choose a sturdy model from a reputed company only to discover the design is not according to your taste. Nixon is one of the most popular watch brands that offers many affordable, stylish, and durable models to suit your tastes. The six watches that mentioned in this Nixon watches review are excellent choices for those who want a watch to match their personality.